You are all anxiously waiting, I'm sure, to see how things went with my trip to Ernest Hemingway's birthplace, which I told you about a month ago before I left for the great mid-west. Well, here's the thing. I ended up passing on Ernie H.
What happened was that the only day the Hemingway Birthplace was open while we were in the areawe were also going biking in an arboretum. Which we had never done before. And that place has 1,700 acres, people. Still, our original plan was to finish up our 7.5 mile bike ride and 4.3 mile walk and head out to wherever Hemingway's birthplace is. But, you see, there were trolls at the arboretum. And after we finished the biking and walking, we had the chance to take part in a troll hunt. A freaking troll hunt! Remember, I'm not that crazy about Hemingway. Also, it just seemed to me that troll hunting outside was much more a Hemingway-like thing to do than going to a house. Hemingway was an outdoor guy, right? He ran with the bulls, I hunted trolls. But all was not lost as far as visiting an author home on this mid-west vacation was concerned. So we were driving from Davensport, Iowa to Springfield, Illinois (Oh, Lincoln. Wow.) and we get off the highway in Galesburg, Illinois for lunch. We pass a visitors' center, except we don't pass it, because my traveling companion can't pass a visitors' center. Now I don't even go inside, because I can control myself. But while he's in there, he finds a brochure for Carl Sandburg's birthplace and it's right there in Galesburg. And what's more, he recognizes that Carl Sandburg is a writer! Seriously, how brilliant is he? So he talks to the woman working there, and she says, "It's open today." This was meant to be, folks. Now, I know less about Sandburg than I know about Hemingway. I read two of Hemingway's books. I know about the bull thing and his granddaughter who does yoga. All I knew about Sandburg a couple of weeks ago was something about fog coming in on little cat feet. But he was a writer. I was on vacation. The game was on. The thing that is really remarkable about Carl Sandburg's birthplace is how small it is. I know that's superficial, but this place is small. Sandburg only lived here a year, and the museum docent said his only memory of the place was delivering milk to it when he was older. Sandburg's parents were Swedish immigrants, and his father worked for the railroad. The family moved on to three progressively larger houses. But all I could think about this house was that it makes a statement about what life was like at the end of the nineteenth century. The house doesn't look that small, you think. Get a load of this front entry. And front parlor. And sleeping area for Sandburg's older sister. Who, sure, was a small child, herself, but still. The parents had a room, which baby Carl shared. And even a mini-dining room. We're not talking a family of four living in a one-room tenement. I'm just saying I was struck by how small this place was. What About A Word Or Two On Sandburg's Writing? Carl Sandburg is known primarily as a poet. But he also wrote some children's books, one of which I bought at the gift shop next to his home. Rootabaga Stories is not my favorite kind of book. An article in Poetry Foundation described the book as nonsense, but in the best sense of the word. "Nonsense is for everyone," the article begins. But not for me. I look forward to a younger family member finding it among my book stash some day and finding pleasure in it. 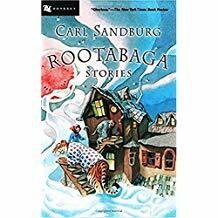 Get this: I don't think I'd ever heard of Rootabaga Stories a couple of weeks ago. But what do I see when I'm reading the September/October issue of The Horn Book? A review of Presto and Zesto in Limboland by Arthur Yorinks and Maurice Sendak in which reviewer Roger Sutton begins, "Yorinks and Sendak take a wander through something like Sandburger's Rootabaga country via their alter egos Presto and Zesto, who find themselves in Liboland just in time for the wedding of the sugar beets." It freaks me out when something like that happens. But in the best sense of the word. 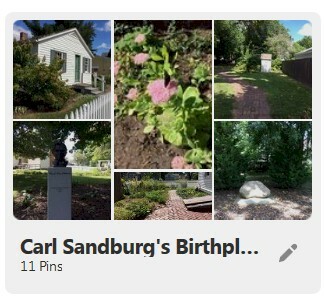 You can check out more pictures from my trip to the Sandburg Birthplace at my Pinterest stash. I loved reading this, Gail, and I learned something too!